It's not too shabby when you can kit yourself from head to toe for £50 - and that includes a pair of leather sandals! All from New Look who kindly offered me a voucher to spend on the current summer range. I worried that white sandals would look a bit 'medical'. Or a bit bright on the eyes but these are just perfect. I actually have exactly the same sandals in black that I wore almost every day in New York so I knew already that they were comfortable and practical. These are serious bargains - real leather for less than £15 and also available in the black as well as tan, on the link above. I bought a size 7/40. 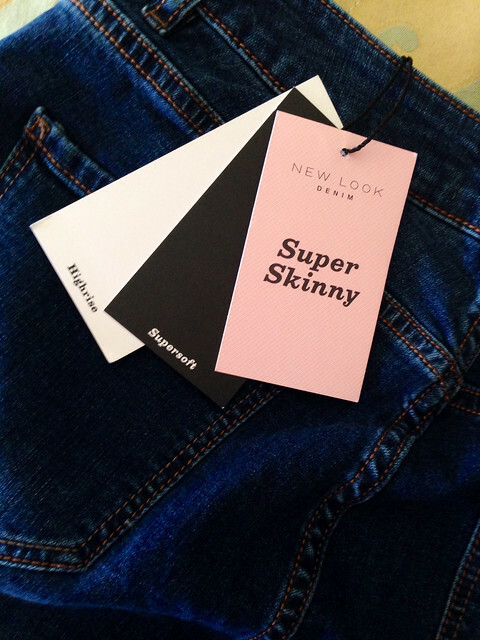 Next up, New Look have great denim and I'd heard good reports about their high waisted super skinny jeans. They' re also in the sale and I have to say, the quality is really nice - well worth the £17.99 price tag. They are soft, stretchy and finish above my belly button. Three ticks! I'm wearing size 12/32. To top it all off, I'm having a real kimono moment. Loving them and trying to not buy more as I'm thinking they're not really practical once the weather cools but this one is only £12.99 and with the black in it, it's a good option for evening wear too. 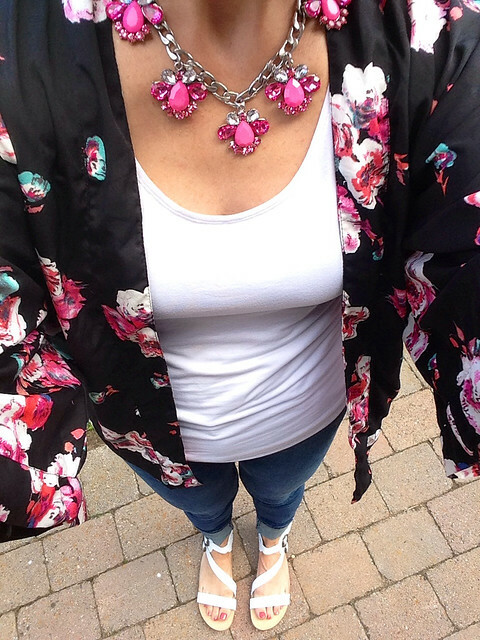 I'd say the quality isn't as good as the New Look £19.99 kimono I bought recently but I adore the print and it goes well with the pink charm necklace from my shop (currently closed while I recover but email me if you need anything urgently). I'm wearing size 10 - can't tell if it's petite or not? Check out the stripes on the lawn....hubby has done an amazing job this year. He's a pretty awesome guy - has been looking after the kids and I so well since I've been off my feet. I just don't know what I'd have done without him #love. I was back in my bed fairly soon after these photos were taken - only so much standing up I can do at the moment but it felt amazing to be dressed in something other than tracksuit bottoms or leggings for an hour or so. And I'm very grateful for all the messages and tweets and texts. Thank you - I'll be back to full strength soon if I keep with the programme of physio, pain relief, rest and gentle walking. 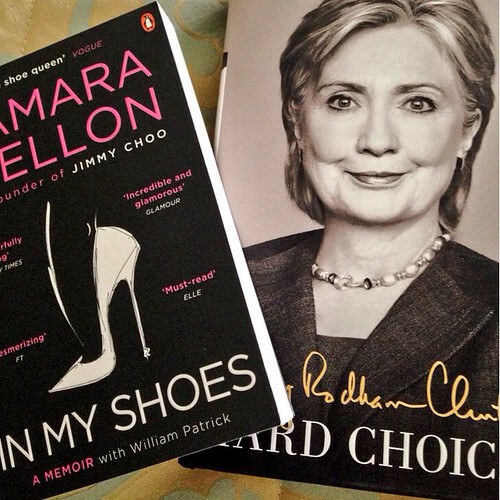 Meanwhile, I've a couple of new books to read while I rest - sent by my Godmother today. She knows me so well! She also sent me the Coco Chanel movie - looking forward to watching it later. Great to see you back on your feet even if only for an hour. Your outfit is fabulous - what a bargain! The necklace looks lovely with it too. Glad you feeling bit better Avril. Your outfit is lovely . Take care and rest up ! I'm loving the sandals! And I've lawn envy! Lovely outfit Avril....hope you get full relief from that back pain soon! 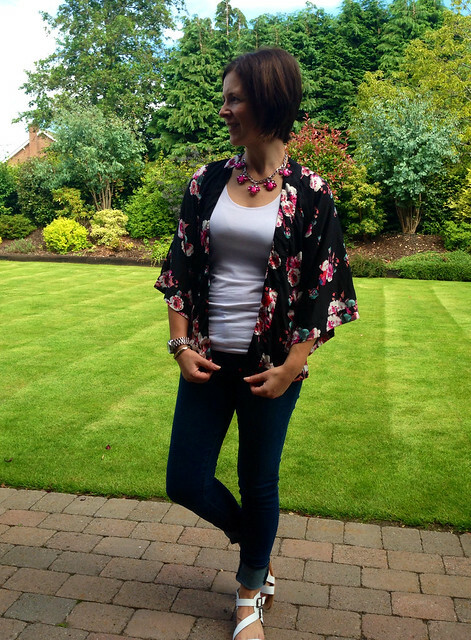 I love that Kimono I featured on my blog last week. It is amazing to think you can get a whole outfit for less than £50! Well done! They are great quality - I really fancy the tan ones but I have to stop buying sandals!! 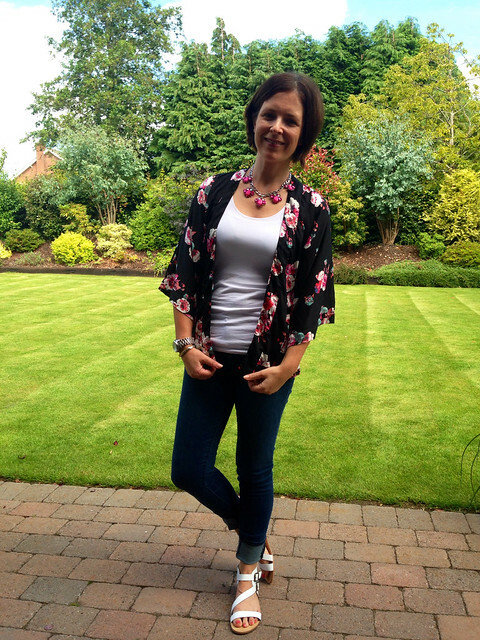 Fab post Avril, can't believe you got the whole outfit for £50! Glad to hear your back is improving & hope your recovery continues at a steady pace. Glad to see you're up albeit it briefly. The things we do for blogging eh? But I know what you mean when even the comfiest pyjamas and jogging bottoms start to lose their appeal and we need to look more ourselves. And the sandals are fabulous. I actually bought the black version earlier in the season but had a change of heart at the last moment for a different pair - also from New Look. Their sandals range is seriously awesome this year.